Let's Collect Polish Star Wars Memorabilia! 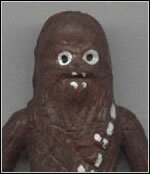 The history of Star Wars items collecting began in 1976 at the San Diego convention. That is where the first T-shirts, badges and posters with the "Star Wars" logo appeared. Then came the time for the novelization and comics and finally after the premiere of the movie the most popular Star Wars product - Kenner figures - appeared. The avalanche of various collectible cards, stamps, clothes, personal hygiene items, utensils, masks and even furniture with Star Wars motifs was a direct, and natural, consequence of the sudden awakening of the collective imagination of the people who were charmed by the world created by George Lucas. In the US and other countries, where the healthy rules of free market prevailed, fans were granted almost unlimited access to such collectibles and toys. However, the situation behind the Iron Curtain remained largely unknown. But it wasn't as bad as it could seem. Countries like Poland or Hungary found themselves under Soviet influence, where every interest in the "decadent art of the bourgeois West" was met with severe hostility and the free press was non-existent. However, even here people experienced a huge explosion of interest in the movie and the phenomena connected with it. Unfortunately, not all of these phenomena arrived in Poland unchanged: we were, among other things, deprived of the pleasure of collecting the licensed items. On the whole, merchandise from the West was not available on the Polish market. As far as foreign goods were concerned, little more than Chinese pencil cases and scented erasers were available. There were, of course, Pewex shops, in which some of the foreign products were available for dollars, but the range of products was rather limited. As far as toys are concerned, it was virtually reduced to the Matchbox cars exclusively. Still, economic isolation had its good sides, at least from the point of view of a cunning craftsman or the modern collector. During the late 1970s and early 1980s, Poland was not bound by any international agreements concerning copyrights, and therefore the production of items - according to the local law -was legal. Still, the technology used by the Polish manufacturers was rather primitive, as sophisticated machinery was not accessible during that period. As a result, the Polish fans received a set of collectibles, the quality of which was rather low. Some of them were pitiful even according to contemporary standards, while with other items the fans were speechless with delight. Today, thirty years later, all of these collectibles awake very warm feelings. They are a testament of an era past, when Star Wars fans cunningly evaded all obstacles put in front of them by Chance and found fulfilment in their passion. They also bring back the nostalgic atmosphere of the days, when - with naive joy - we were discovering the world of the galaxy far, far away. Each category contained tens, sometimes even hundreds of different variations, as was the case with photographs for instance. It's time to give them a closer look! Star Wars premiered in the US on May 25th 1977. The Polish premiere took place two years later, on March 1979, which wasn't a bad result by contemporary standards. As far as I know Germans had to wait a year and Star Wars didn't hit the Russian cinemas before the 1990s. Russian fans however, were able to see it on TV as a series of 5-minute-long episodes, which were broadcast on one of the private TV channels created after Perestroika. The very first official Polish collector's item is actually the poster created by Jakub Erol. It presents C-3PO set against a background of white spots that stand for stars. The lettering brings to mind the stories about the Wild West. The reason behind such a device is the popular opinion about George Lucas's movie, which was often referred to as the "western in space". What we don't know however, is the reason for misspelling Alec Guinness's name. Instead of "Alec" the author used "Aleo"! What further adds to the magical atmosphere of this remarkable masterpiece of Polish poster art, is the fact that it was in all probability created during Christmas - next to the artist's signature is the date 26.XII.1978. The lower part of the poster features a logo of the Polish movie distribution company, ZRF ("Zespoly Rozpowszechniania Filmow"). During the vintage era, ZRF was the only distributor of foreign movies and, as a result posters as well. It changed its name to Polfilm in 1980 and retained the monopoly until the fall of the People's Republic of Poland. The posters were meant for cinemas entirely - they were not sold anywhere else and those collectors who were able to acquire them owe it to their resourcefulness only. Posters for the other episodes were also quite original. "The Empire Strikes Back" by Jakub Erol is an artistic interpretation of a man's head in a helmet. Oddly enough, the author again managed to misspell one of the names - this time, the name of the director. Instead of "Irvin Kershner", the poster features an "Irvin Wershner". This error was noticed and pointed out 16 years later by the publisher of the TOPPS Star Wars Galaxy Series 2 cards. However, they too made a mistake and changed the last name of the artist from "Erol" to "Frol." Could this be a curse? Of considerable interest is the alternative poster for The Empire Strikes Back, whose author's name is Lakomski. It features an AT-AT walker and Yoda and, interestingly enough, measures only 67 x 46cm (most of the other posters measured about 90 x 70cm). Mr. Lakomski's poster became a rarity still in the 1980s, since it was distributed by the city of Lodz district film distribution company only in the area under its direct influence. There were 17 different district distribution companies (Okregowe Przedsiebiorstwo Rozpowszechniania Filmow - OPRF) in Poland. 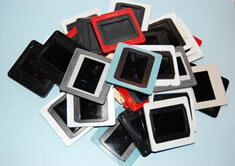 Each was dependent on ZRF/Polfilm and distributed films and promotional material in a given area only. Some of them printed posters for their own use - also commercially. Definitely the most sought-after poster was created by a Mr. Dybowski. It pictures Darth Vader with an exploding head. Upon careful inspection, one will find several elements of a film camera among the pieces of the shattered helmet. The second poster by Mr. Dybowski is by contrast the least interesting work of art for collectors, thus bringing back the balance in nature. Pictured on it are red haired Luke, the princess, Han and Threepio. If someone wanted to immediately purchase one of the Star Wars posters today, they must take into consideration a cost of about $1000. If you're lucky, you may be able to find yourself a bargain for 300-600 PLN. And if you're really lucky, a poster will set you back 2 PLN in the flea market. According to my sources - since I did not witness this myself - the box offices for certain cinemas (like the one in Wieliczka) sold various photographs. These weren't exactly the same photos that were hung behind glass by the entrance to the cinema because of the different sizes. It appears however that we're dealing here with something similar to a licensed collectible. 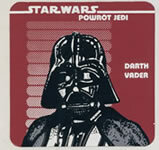 A stamp is present on the back of the photos available in box offices, with the name and address of the Polfilm company, the official distributor of the Star Wars saga. 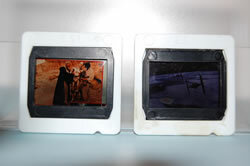 The photos came in two sizes: 13 x 9cm or 18.5 x 13cm. The photos placed behind glass were 26 x 18cm, but there are no stamps on the back. The basic source for Star Wars collectibles during the late 1970s and early 1980s was the newspapers. Almost every young fan of the film had a scrapbook, in which they pasted photos or (rarely) whole articles cut from the paper. 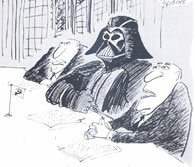 Articles concerning Star Wars appeared in many different periodicals and were always full of various factual errors. Names and last names of characters were often misspelled or the author invented and applied strange ideologies to the movies. Generally speaking, journalists didn't care much for the subject matter. It looked as though each and every author tried to to show his distance from George Lucas's film, thus proving they were only interested in "serious" art created by well-known authors. There's perverse joy in reading these old articles today. Still, these old, faded and indistinct photographs contain the true atmosphere of those days and allow us to go back, if only for a moment, to a totally different world. Youth magazine "Swiat Mlodych" (Youth World), which appeared three times a week, gave Star Wars the most attention by far. 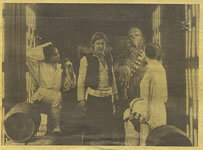 Photographs of the characters appeared occasionally in the "Gwiazdozbior" (Constellation) column; before the premiere of Return of the Jedi, a photograph from the episode was published regularly for several weeks, every Friday. This was a real treat for young fans, who waited for the new issues of the magazine with much anticipation. Creating a full list of publications about Star Wars is pointless, since they cannot be regarded as collectibles per se. It should be mentioned however that there are whole collections of old articles in existence, and even from time to time a scrapbook with articles appears on one of the Internet auctions. You'll find quite a number of newspaper extracts in my museum: cuttings. You'll find many other examples on Michal Guzewski's website, SWretro. Swiat Mlodych also played a different role - it became a sort of a contact point for "Star Wars" fans. 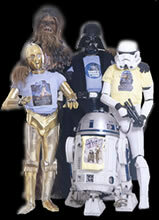 Star Wars enthusiasts posted their advertisements there, offering photos or information for trade. Some of the ads were placed by unofficial fan clubs which dealt in all sorts of activities. One such fan club - "Falcon" - the headquarters of which were located in the town of Brzeg, dealt largely in the distribution of Star Wars books. The books were "published" through unprofessional means - the content was translated and later typed using an ordinary typewriter. The pages were then copied on a duplicator . Covers were made from sheets of cardboard in different shades - some copies are slightly brighter, some have an orange tint. A symbol in the form of a black horse was placed in the upper right corner of some of the issues. Interestingly enough, the exciting cover for "Return of the Jedi" was printed in a dark blue colour. And there are two title variants in the case of scrapbook Episode IV novelization. Sometimes the cover comes with the "Nowa nadzieja" inscription and sometimes with "Gwiezdne wojny". "A New Hope", "The Empire Strikes Back", "Return of the Jedi", "Han Solo at Star's End", " Han Solo's Revenge", "Han Solo and the Lost Legacy" and "Splinter of the Mind's Eye." 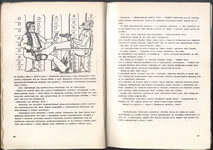 Some of the copies of "A New Hope" contained illustrations, but most of the issues were deprived of such an attractive element and the other books do not contain any illustrations at all. Only 100 copies of each edition were distributed. 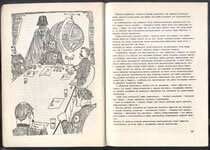 Keeping the low number of issues allowed the publisher to avoid problems with censorship, since because of the microscopic circulation the books were treated as material for internal use of the club. There were many editions however, and as a result a few thousand copies of each book made its way onto the market. It is difficult to provide the publishing date of the first three books, because the information has never appeared on any of the pages. The publisher's imprint appeared only in "Han Solo at Star's End", quoting 1985 as the year of publication. During the years 1986-1989 Star Wars appeared in print in a booklet published by the Silesian Fantasy Club (Slaski Klub Fantastyki), titled "Fikcje" (Fiction). "A New Hope" was published in instalments. The last issue of this magazine was published in 1990 and featured the full translated text of Donald F. Glut's "The Empire Strikes Back". which made up the novel. Unlicensed photographs were certainly among the most popular collectibles during the Polish People's Republic era. The majority of the photos were produced by the Fotoplastykon company from Poznan. Although the company's activities also included various services conected with artistic photography, in Star Wars fan's eyes Fotoplastykon was only a small shop filled with a certain smell, where it was possible to purchase a photograph of one of the characters from our favourite movie. The shop was located by the Armii Czerwonej St., now known as the Sw. Marcin St. In the early 1980s, the shop became a sort of an unofficial meeting place for Star Wars fans from Poznan and nearby areas. Waiting in the queue for a good few minutes with the rest of the enthusiasts, fans wanted to buy beautiful photographs with scenes from their favourite movies. If I recall correctly, apart from Star Wars, photos from the set of "Enter the Dragon", "Conan", "Rambo" and "Commando" were also popular. Photographs and posters with rock bands, singers and a whole lot of other youth idols constituted a healthy portion of the merchandise on offer. During the period of popularity of the Star Wars movies, the choice of photographs was vast indeed, ranging from small rectangle shaped photographs (6.5 x 5cm) and standard black-and-white photographs (13 x 9 or 14 x 9cm), to huge posters to hang above the bed. Black-and-white photographs were certainly the most popular - the price seemed ideally tailored to fit the budget of a pupil, who received money from his parents to buy tea or milk in the school canteen. The price for the colourful miniatures was identical, however their size wasn't very appealing. Colourful photographs in standard sizes were a rarity, which one was able to purchase once in a blue moon. The poster-sized photographs were purchased by older and financially independent fans. The theme of the photos varied, although they shared a common characteristic - most of them were reproductions from the magazines. They were composed in numerous ways. One could find photos presenting a given scene or a close-up of the hero, but there were also collages taken straight from the newspapers. Among photographs commonly found in the Fotoplastykon shop were the reproductions of drawings by Ralph McQuarrie, photos of toy boxes, cropped scenes from advertising material and pictures of gramophone record dust jackets. Although Polish newspapers served as the basis for some of the copied material, the most commonly used source was the German edition of the Bravo magazine. 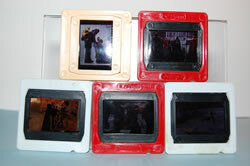 Some of the photographs featured action figures by Kenner. The thought that my friends had to settle for photographs of toys, which were freely available for their colleagues abroad, still fills me with melancholic sadness. It's also a good reminder to stay away from anything that has "socialism" in its name. Similar photos were also available in many regions across the country. They certainly appeared in Ełk, Gdansk and Cracow as well, where you could buy them in a book fair near the building of the covered market. Similar fairs have been organised every Sunday to this day. It is impossible to say whether all the photographs came from Poznan, or if they were also produced in other cities; evidence seem to suggest that several independent manufacturers were involved. Similar photographs were also avaliable as prizes at shooting ranges. To get them, you had to shoot the wooden stick, on which a given photo was fixed. A large collection of these photographs can be found in the Starwarsy museum; more precisely: here. The Cracow fair was also a place where one could find Star Wars slides. The full set consists of at least 34 different elements and quite possibly there were more of them. Some of them were probably created from the booklet, which was attached to the original edition of the Star Wars analogue record. The characteristic red borders around some of the photographs are evidence of that. Today, with the popularity of digital technology, when fans have various versions of the Star Wars trilogies in their homes - with vivid computer colours and remastered audio tracks - it is hard to imagine that a picture projected on the wall could bring joy and happiness to people (especially if the photograph was crooked or badly cropped). But still! Never underestimate the power of imagination. For many fans, Star Wars self-adhesive stickers were merely a dream. They were not easily accessible, which is probably due to the fact that they were manufactured by a small company with a rather insignificant reach. What I was able to establish for certain, was that they were available in stationery shops in Warsaw, Elk and Lublin. A triangle-shaped sticker with Darth Vader on the flaming pyre is also known to have existed. It was sold in box offices in cinemas, where The Return of the Jedi was screened. Unfortunately I was unable to acquire it, even though it was also available for a short time in Poznan, my home town. 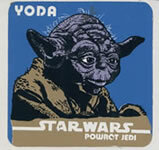 Stickers dimensions: Yoda and Vader - 77 x 77mm; Luke and the droids - 73 x 105mm; Jabba - 105 x 75mm. As you've probably guessed, the sticker with the smaller image of Yoda is meant to be placed on a school notebook, and must therefore be considered a stationery product. 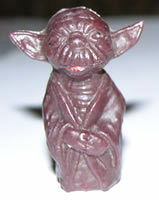 Among the different stationery products available in certain stores, was a small figure of Yoda. This beautiful item was designed to decorate pencils and pens, which was possible thanks to a hole drilled in the body of the figure. By putting Yoda on one of the ends of the pencil, one could create a killer combo and an object of jealousy amongst fellow students! As you can clearly see, the colour of the pencil top is not particularly intensive, bright or happy. Such colours, however, were dominant in our country during the time the item was produced. We have seen so far that the Polish Star Wars collectibles were mainly made of paper or plastic. However, there are also items which constitute a combination of these two elements, with the addition of a piece of steel ;-). The pins - also known as badges - featured a nice picture glued on the plastic bit, and a safety pin to attach it to your clothes. The size of the pin was 3 x 4cm. The pictures seem to be based on the early TOPPS cards, a fact which is evidenced not only by the original, psychedelic design, but also some of the captions (e.g. "Alec Guinness as Ben", a line taken straight from the TOPPS card). These collectibles were available in the "Ruch" kiosks (newsagents) as early as the first half of the 1980s. All available sources seem to confirm that the pins came in 10 different variants. You can see all of them on the left below. Unarticulated figures of the droids R2-D2 and C-3PO appeared in Polish stationery shops and toy stores near the end of the 1980s. Made of hard rubber, these figures were given quite fanciful colours. They are bootlegged versions of the figures originally sold in Disney's amusement parks. into the parks - a simulator called Star Tours, which allowed one to go on a cosmic journey and see the space ships from episodes IV-VI in action. In contrast to the original version, the Polish figures do not have any symbols or writing on them (e.g. "L.F.L. Limited"). The size of these toys allows them to be put next to the bootlegged Kenner figures, which were manufactured in the same scale. Similar bootlegs propably appeared in Germany as well. The title Most Popular Polish Collectible goes to the bootlegged versions of the Kenner figures. With no access to the original Kenner toys, Polish kids had to do with imitations, which were available in nearly all toy and gift shops. The range of the figures was quite vast - 60 different pieces appeared on the market, all of them in many colour variants. Several independent manufacturers were responsible for their production. Today, the figures are of great interest not only to Polish Star Wars collectors (who collect them for sentimental reasons), but they are also popular among foreign fans, who wish to have an exotic item in their collection. The subject of Polish bootlegged figures is so broad that a separate article was necessary to cover it - and so I wrote one. Have a look at the "Guide to Polish Bootleg Star Wars Figures". It is obvious that most of the Polish collectibles are of inferior quality when compared to their original counterparts. Playing with a green, unarticulated Scout figure or torturing the eyesight while reading photocopied books was not what all Polish Star Wars fans dreamed of. The posters were shocking because of their casual interpretation of the subject matter, and the quality of the pencil tops was appalling. Today however, these flaws are what make the collectibles particularly attractive and unique. While looking at these old items it is hard to resist the impression that there is a unique atmosphere enclosed within them. Behind every crooked collectible peeks out a piece of history, and each item is tied to someone's emotions. After years of maturing, like an exquisite wine, these items became a highly desired and attractive addition to the main course made up of the official collectibles. The information and collectible pictures used in the article come from the author (it's me! ), Katarzyna Drabik, Michal Guzewski and Andrzej Bednarczyk.